It's that time of year, between Christmas and New Year, when half the world seems to go on hold, so I thought I might pause and look back on MEI's 2011. In my first posting of the year, I noted that soaring metal prices had provided a fine start to the year with the promise of increased confidence in the minerals industry. This was certainly evident in the major conferences that we attended during the year, many of them reporting record attendances. January was dominated by news of the disastrous floods in Sri Lanka, Brazil and Queensland. 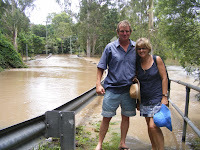 Even in the face of adversity the human spirit prevailed, and our flotation consultant Dee Bradshaw and her husband Mike provided some great photos of them smiling through the clean-up in Brisbane. 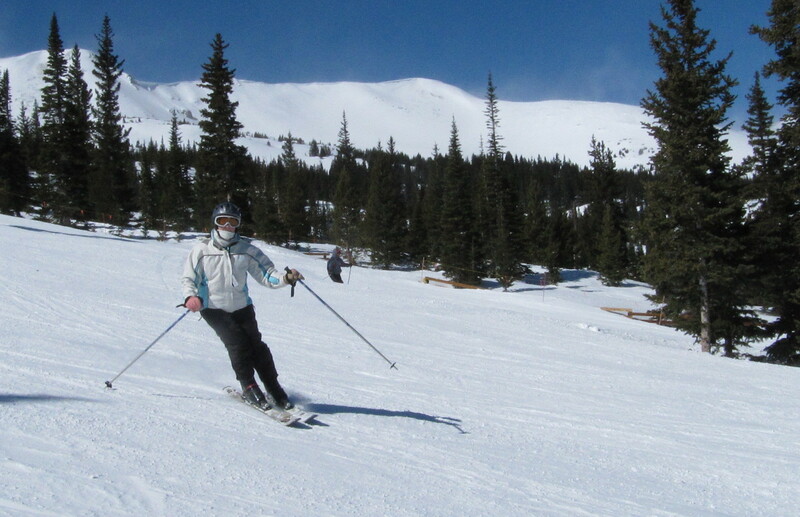 My favourite venue for the SME Annual Meeting is Denver, as it gives Barbara and me the opportunity to ski for a week in Breckenridge, a lovely old gold mining town high in the Rockies. This years SME in March was one of the best, with a turnout of well over 5000 delegates, one of the largest for several years. 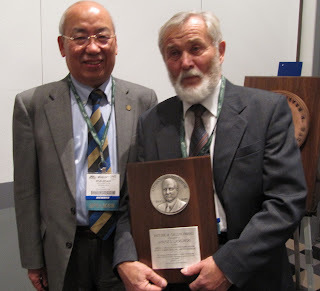 The Roe-Hoan Yoon Symposium attracted many mineral processors, and it was good to see Janusz Laskowski honoured with the Gaudin Award, adding to his long list of major awards for his services to mineral processing. I look forward to next year’s SME, which will be held in Seattle. 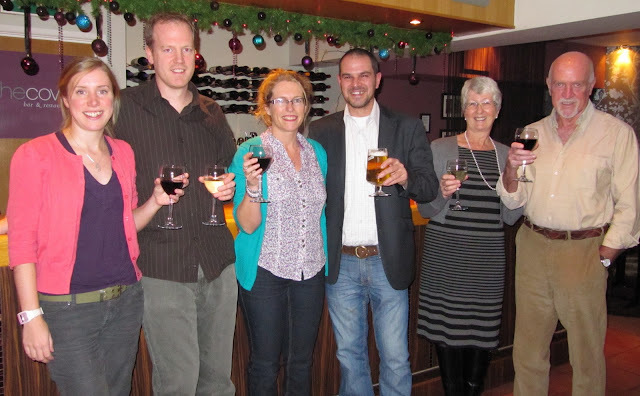 Also in March the MEI LinkedIn group Minerals Engineers welcomed its 1000th member. This has become a very dynamic group, with many active discussions. Currently we have over 1950 members, so it will not be too long before we welcome member number 2000. Mid-May is a wonderful time of year in Cornwall, with the bluebells and gorse in full bloom. 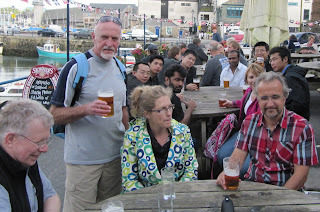 The sun shone for the 2nd SRCR conference in Falmouth and for my 6-mile guided coastal path walk, which ended with a welcome beer in old Falmouth. The highlight of the three days was the memorable conference dinner at Cornwall’s iconic Eden Project, where we had the huge Mediterranean biomine to ourselves to enjoy a great setting and excellent food and wine. 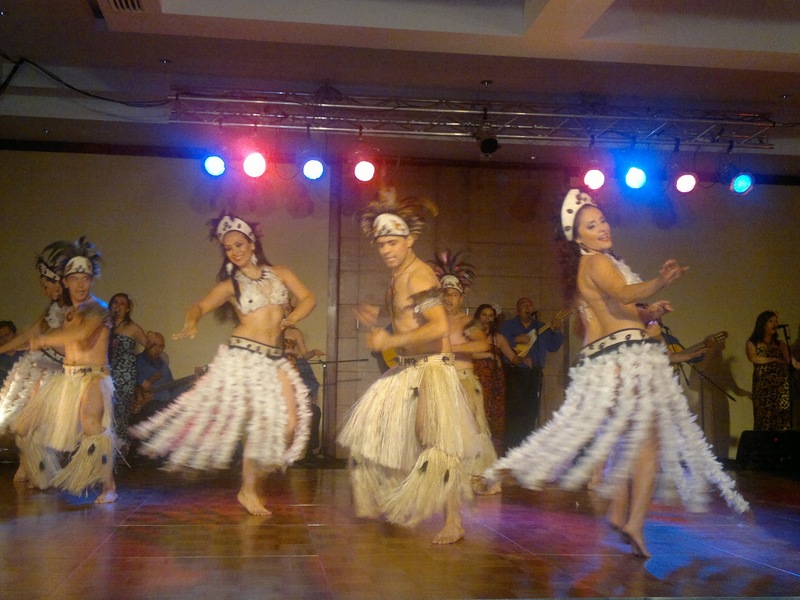 We were so impressed with this that we have booked it again for next year’s Biohydromet ’12 conference dinner. 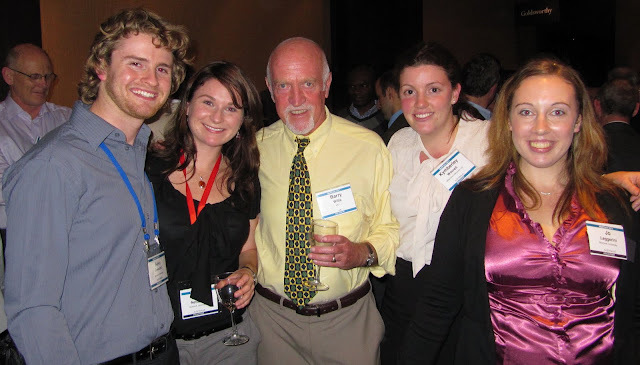 Shortly after SRCR ’11 I was off to Perth for my first ALTA conference, a 5-day marathon event covering the hydrometallurgy of copper, nickel, cobalt, uranium and gold. Apart from the shock of finding how expensive Australia has become, it was really good to meet the conference organisers, husband and wife team Alan and Joan Taylor who proved, as MEI already knows, that small is beautiful regarding conference organisation. 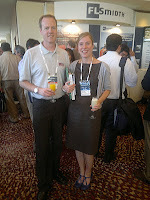 Amanda will be representing MEI at ALTA '12 in May. I returned from Perth just in time to see Amanda complete the annual charity swim across the river Fal estuary from Pendennis Castle to St. Mawes castle, raising money for the Royal National Lifeboat Institute. 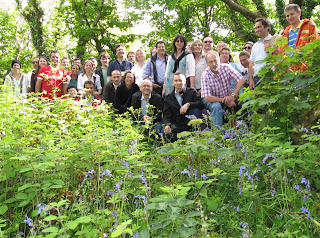 Two small MEI Conferences ran back to back in Falmouth in mid-June. Computational Modelling ‘11 attracted 41 specialists to this rapidly evolving field, and discussions were intense, but we all found time to relax at the Chain Locker pub after my usual coastal walk. 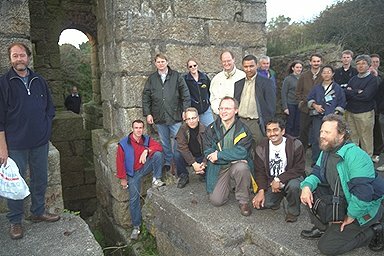 Immediately following Computational Modelling ’11, 52 international delegates attended Physical Separation ’11, always an enjoyable event, which ended with a tour of the 19th century tin mining area between Camborne and Redruth. July was a very good month for us, with the news early in the month that Minerals Engineering continued to hold its number one ranking of mineral processing journals. The most enjoyable trip of the year was to South Africa’s ‘far north’, the Limpopo, to attend the SAIMM’s Base Metals ’11 conference in Phalaborwa. 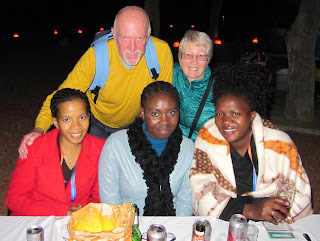 We drove from Johannesburg to Louis Trichard before heading east, and entering Kruger National Park at the most northern gate, giving us the opportunity of driving the whole length of the Park, leaving in the central section for the conference in the copper mining town of Phalaborwa. The conference was held at the excellent Hans Merensky Hotel, the grounds of which also teemed with wildlife. It was a truly enjoyable 4 days, which included an evening bush-braai in Kruger and a tour of the Palabora Mining Company’s surface operations, which was a disappointment as most of our time was taken up by endless security and health and safety inductions, a far cry from my previous visit 33 years ago where I drove straight into the mine complex to meet the manager! 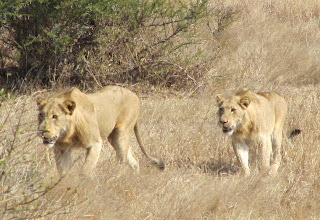 From Phalaborwa it was back into Kruger and a wonderful drive through the central and southern sections, with memorable wildlife encounters. 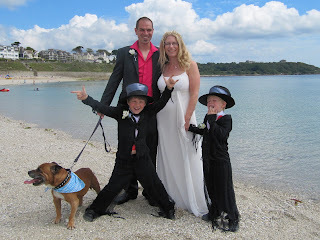 Then back to UK, for our highlight of the year, Amanda’s wedding to Richard. The sun shone for some great photos on our local Gyllyngvase Beach and their boys looked great in their zombie costumes! 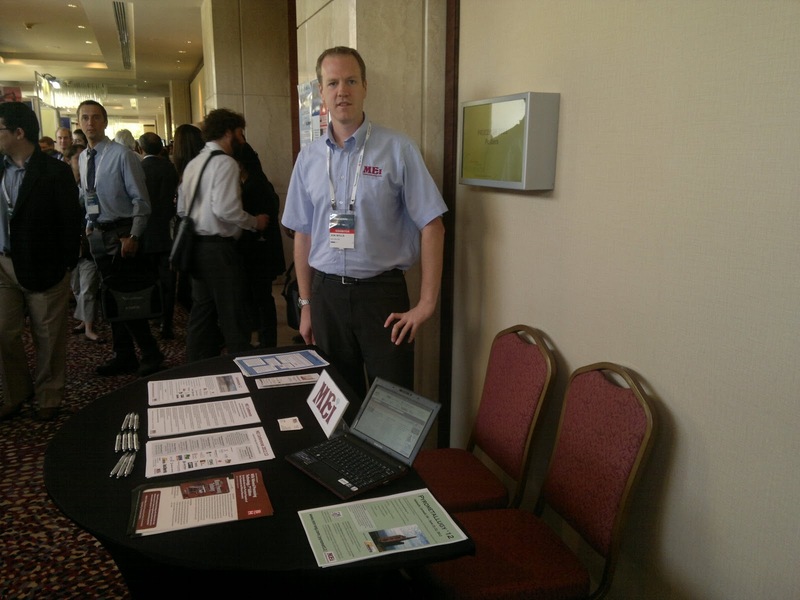 I was back in Perth in August for the AusIMM’s 2-day Metplant conference, attended by a record 330 delegates. It was a great conference for networking, and I particularly enjoyed talking to the undergraduate metallurgy students from Murdoch University, who had been given the opportunity of attending the conference in return for their assistance with the conference infrastructure. After a long journey back to Falmouth, I was at the Camborne School of Mines reunion the next day for an interesting tour of the Tremough Campus in Penryn, which included the impressive SEM facilities, including a modern QEM-SCAN, used mainly for research and teaching. We are promised papers on this research at next year’s Process Mineralogy ’12. Our advisor to this is Megan Becker, who represented MEI at the 10th International Congress for Applied Mineralogy in Norway in August. Congratulations also to Megan on the birth of Peter later in the year. 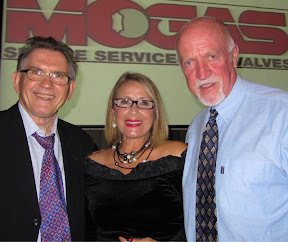 I was in Montreal in October for the 50th Anniversary of MetSoc, which included World Gold ’11 as a major part of the Conference of Metallurgists programme. There was a huge turnout of over 800 delegates for COM ’11, over half being for World Gold. 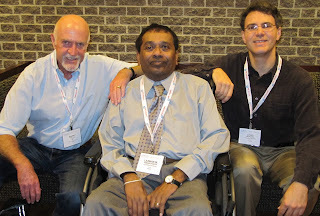 The highlight of the week for me was the luncheon to honour Laxman (Lucky) Amaratunga, of Laurentian University, who I have known for 20 years, since he and his wife Nan attended Minerals Engineering ’91 in Singapore. Flotation ’11 in Cape Town in November was MEI’s largest ever conference, with 283 delegates from 30 countries. Apart from the excellent programme it will be remembered for one of the best conference dinners that we have had in South Africa, at Cape Town’s Gold Restaurant. This will also be the venue for the conference dinners at next year’s Comminution ’12 and Process Mineralogy ’12. 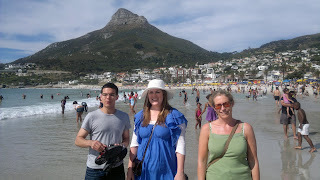 After Flotation ’11, the MEI team went their separate ways, Barbara and me for a week’s relaxation in Madagascar, then back to the Cape, while Amanda spent a few days at Camp’s Bay, just south of Cape Town, where she met up with Flotation ’11 friends from Imperial College. Jon and Kathryn headed back to UK for a few days after the conference and then flew out to Chile for Procemin ’11 in Santiago, where Kathryn presented three papers and chaired a session. Then back to the UK after a couple of days spent munching steaks in Buenos Aires. All in all a very interesting year. I guess this will be the last blog posting of 2011, so let me take this opportunity, on behalf of MEI, of wishing you all once more a very happy and prosperous 2012. 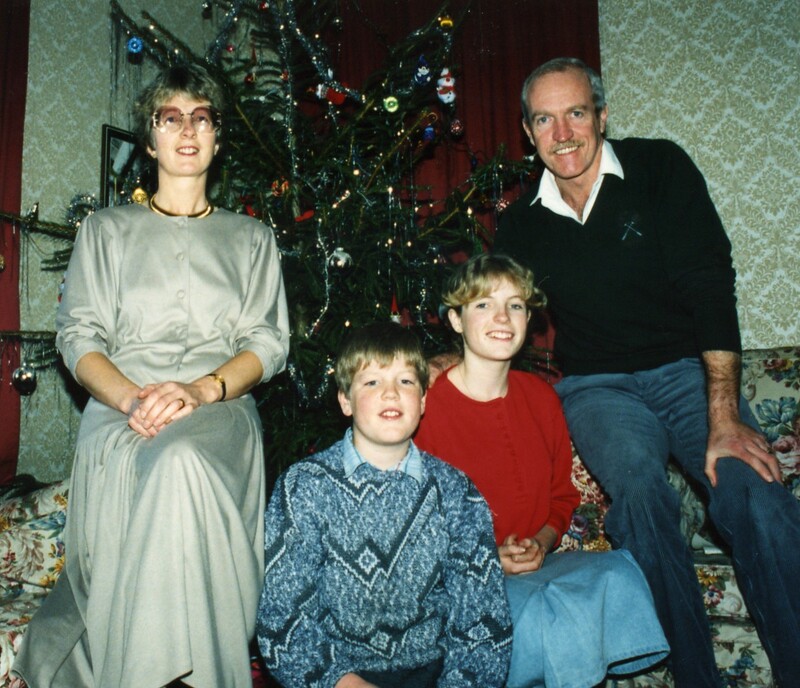 Well, it is Christmas day, and a time for families to get together, so this week's photo is one of our annual Christmas pictures, taken 24 years ago today. I apologise for any embarassment that this may cause Amanda and Jon! Best wishes to you all. Have a great day. The provisional programme for Comminution ‘12, which will be held in Cape Town in April, has now been published. It is a tightly packed timetable, with papers from all the top names and institutions from around the world, including keynote lectures from Chris Rule, of Anglo American Platinum, South Africa and Ted Bearman of Bear Rock Solutions Pty Ltd, Australia. Only three 3m x 2m and six 2m x 2m booths are currently available in the exhibition area, and we would suggest that you reserve your accommodation as early as possible, particularly if you wish to stay at the Vineyard Hotel, the conference venue. The conference dinner will be held at the Gold Restaurant in the centre of Cape Town. As the conference evolves, the latest updates will be posted on Twitter. You need not have a subscription to Twitter to view this, and these updates can also be found on MEI Online, so if you are attending the conference, please bookmark one of these links. Registration is now open for the conference and exhibition. Flotation '13 is only 2 years away!! 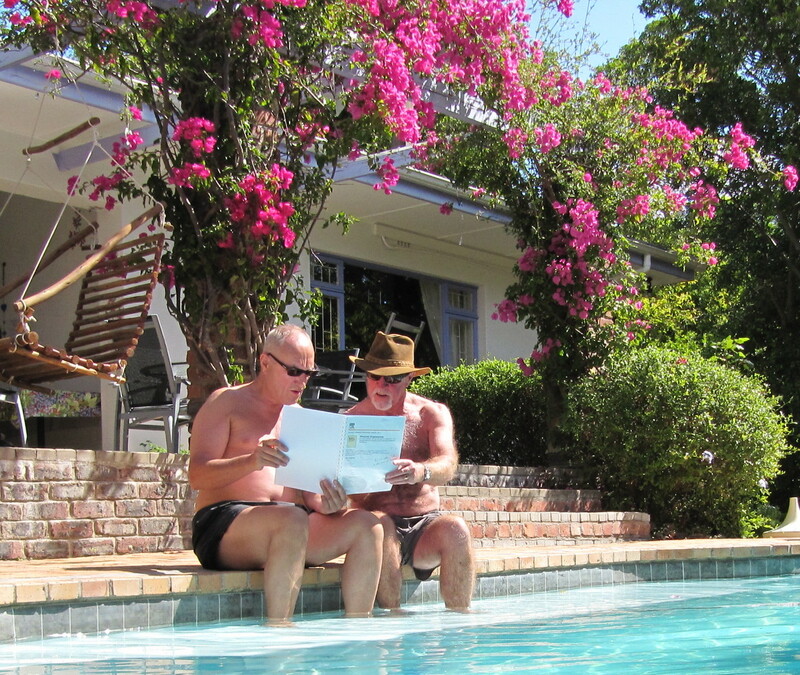 Add November 18th-21st 2013 to your diaries, as the countdown has begun to Flotation '13 the 6th International Flotation Conference, to be held at the Vineyard Hotel in Cape Town. As always, the 4-day conference is split into two discrete symposia, Fundamentals on the first two days, followed by Applications on the final two days. 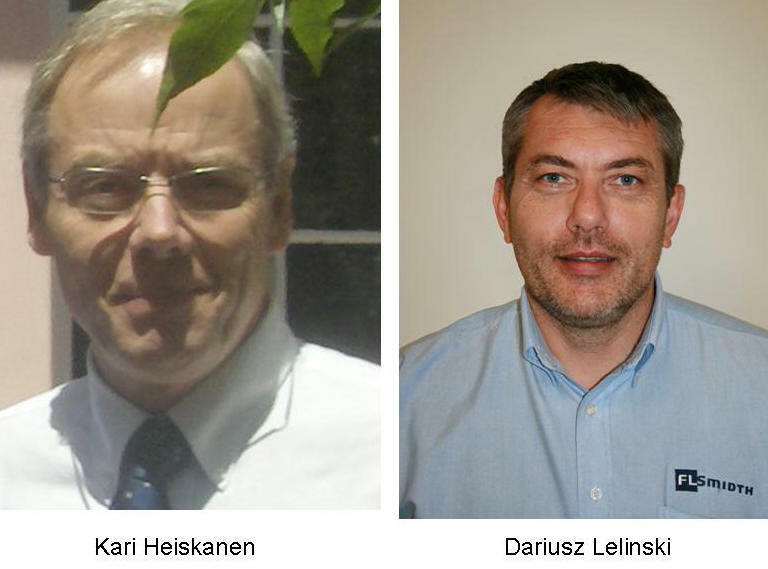 The keynote speakers are already in place, Prof. Kari Heiskanen of Aalto University, Finland, for Fundamentals, and Dr. Dariusz Lelinski of FLSmidth, USA, for Applications. If you would like to keep up to date with the conference as it evolves, then bookmark Latest Updates, or follow the updates on Twitter. 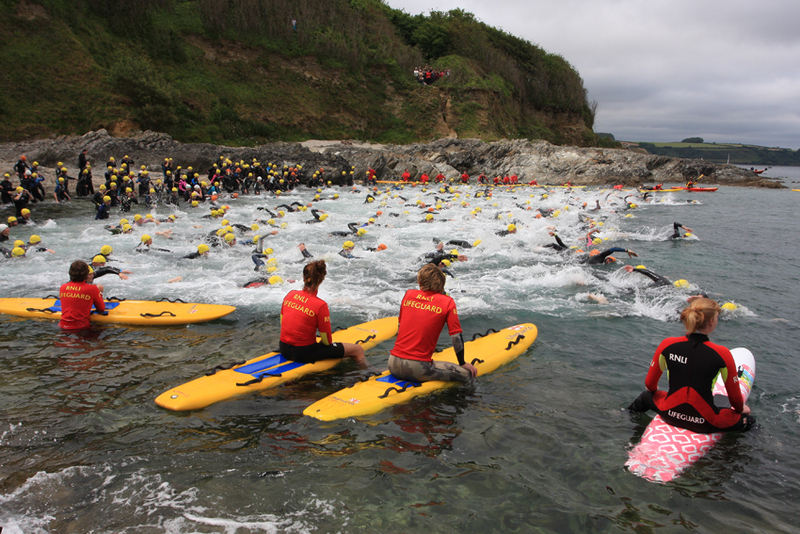 We are also pleased to announce that the first major sponsors for Flotation '13 are FLSmidth and Magotteaux, both regular sponsors, and Aminpro Chile, who we welcome as new supporters of this series of events. Many thanks to everyone who has sent us greetings, either by post or by email. We would like to take this opportunity of wishing you all a very happy Christmas and all the very best for 2012. Please stay in touch with us via the blog, MEI Online, LinkedIn, Twitter and Facebook. We hope to meet as many of you as possible next year, at the many major events taking place, including MEI’s 6 conferences, the SME Annual Meeting in Seattle, ALTA 2012 in Perth, the AusIMM Mill Operators’ Conference in Tasmania, the IMPC in New Delhi and Procemin 2012 in Santiago. 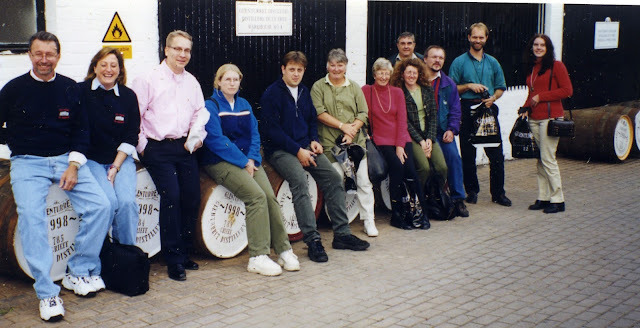 This photo was taken at Wheal Basset, in the Camborne-Redruth mining area in September 1999, during Minerals Engineering '99. 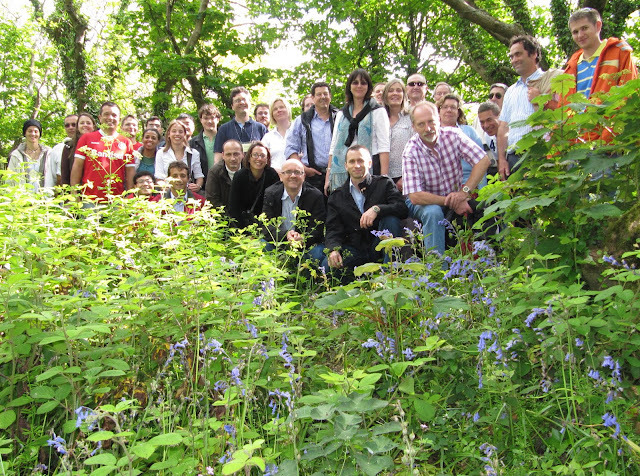 It was the first of many visits to the 19th century Basset Mines for MEI Conference delegates. Delegates are standing below the main engine house which drove the stamp batteries, and by one of the deep pits which housed one of the giant flywheels. 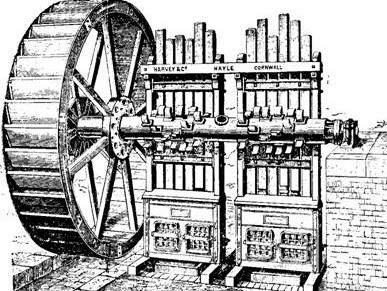 Comminution has evolved rapidly this century, away from the traditional rod and ball mill circuits, towards circuits incorporating HPGR, and SAG and AG mills, and designing for the concentrators of 2020 is the main theme of April’s Comminution ‘12. The need to grind ever finer, as ores have become more complex and of lower grade, has led to the successful adoption of stirred mills. The most successful of these has been the IsaMill, which has led the way in energy efficient fine grinding since its development in the early 1990s, delivering energy savings and improved metallurgical recoveries (see Wills and Napier-Munn, Chapter 7 for a full description). The world’s then largest ultrafine grinding mill, the 2.6 MW M10,000 IsaMill, was commissioned in 2003 at Anglo Platinum’s Western Limb Tailings Retreatment Plant in South Africa, and Xstrata Technology has recently celebrated the sale of the 100th IsaMill into the mineral processing industry worldwide (see MEI Online for full story). The mill was one of four large 3 MW, M10,000 IsaMillsTM installed in South Africa at projects operated by Anglo American Platinum, two of which are partnered with Xstrata Alloys and African Rainbow Minerals. 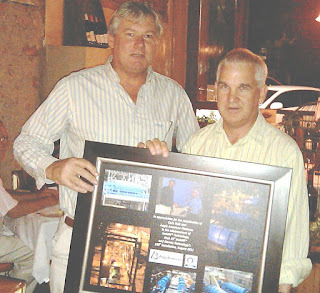 This milestone was celebrated with a dinner attended by representatives from Netzsch, Anglo and Xstrata Tech. In the photo Lindsay Clarke – GM Mineral Processing, Xstrata Technology presents Chris Rule, Head of Concentrator Technology, Anglo American Platinum, with a gift to celebrate the milestone. Chris will be presenting the first keynote lecture at Comminution ’12, 2020 - what will the typical PGM Concentrator flowsheet look like?, which will feature the use of IsaMills, and there are several other papers in the programme discussing their optimisation and also their use for coarse grinding applications. Noticeably the word ‘rod’ does not feature at all in the list of papers! The minerals industry- the acceptable face of capitalism? Does lithium have an uncertain future? We welcome your comments on blog postings. If you do not have a Google account, the simplest way to add a comment is by selecting 'anonymous' as your profile, but please leave your name and affiliation in the comment. Alternatively, email your comment directly to bwills@min-eng.com. If you would like to be alerted to postings, submit your email address via the box in the right hand column. 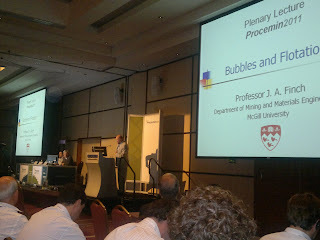 A report on Procemin 2011, Santiago, Chile, by Jon Wills of MEI and Kathryn Hadler of Imperial College, London. After arriving in the morning to a very hot Santiago, I spent the next few hours exploring the city with Kathryn Hadler and Gareth Morris of Imperial College, a highlight of which was Gareth being interviewed by a local student! As a first time visitor to the city I found it relaxing and friendly with the old centre contrasting nicely with the new Bellavista area. The Sheraton Hotel was the venue for Procemin 2011 which started this evening with welcome talks by the organisers, who announced an attendance of 444, followed by drinks and canapés in the exhibition area. 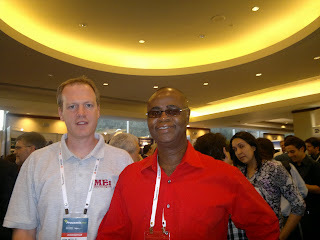 This provided a good chance to catch up with some of the delegates who were also at Flotation ‘11 such as Chris Greet of Magotteaux and to also reacquaint with delegates from past MEI conferences such as Jonas Addai-Mensah (left) from the Ian Wark Research Institute, Australia. 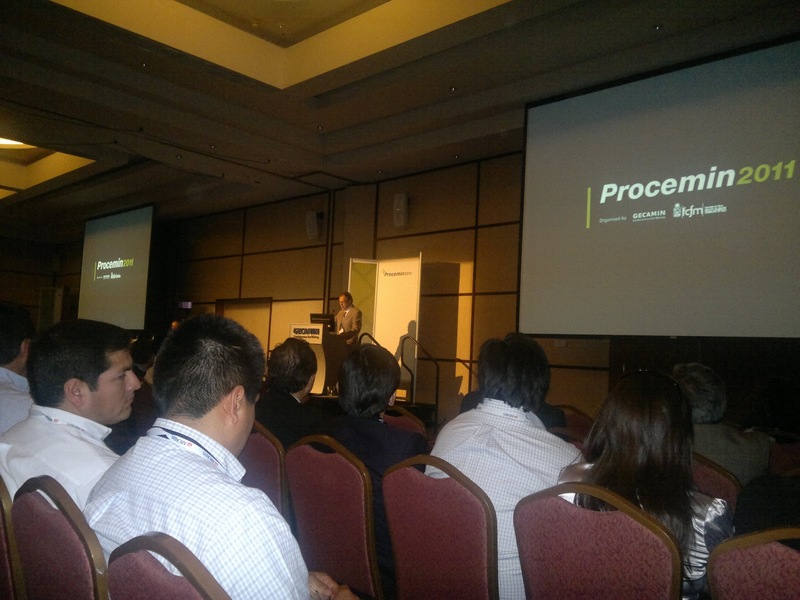 The first time I attended Procemin was in 2009, and it proved to be a great conference for presenting our research to a new audience, since the majority of the delegates are Chilean or from neighbouring countries. Although the conference is held every year, this is a little too frequent for us, and so 2011 is my second time here. There is simultaneous translation available, and hats off to the translators for an excellent job. (Note to self: Must learn some Spanish). Thursday started with a plenary session, the first talk on SAG milling at Antamina, which I sadly missed as I was preparing for my three (3!) talks that day. The second plenary talk was given by Jim Finch, as always excellent, and with a very interesting take on air rate profiling (a subject close to my heart), which he rebranded as ‘recovery profiling’ using air rate to manipulate mineral recovery of a bank to the desired profile. This conference does have the dreaded parallel sessions, however they are broadly split into flotation and comminution topics for the most part. Speakers are required to sit in all of the talks in the session, which meant I was confined to the flotation talks for the day, but this was no bad thing. On the whole this conference is more operations-focussed than, say, Flotation 11, and there were recurring themes throughout the conference - water supply and quality being one example. The first session, in fact, contained two talks on water quality, with others on frothers and depressant. A long day finished off with some more flotation fundamentals in the final session, by which time the audience were building up quite a thirst for pisco sours. The conference dinner took place in the hotel ballroom and after a welcome speech from members of Gecamin we sat down to a 3 course dinner with local wines. The genial host of my table was Gecamin’s General Manager Carlos Barahona and I sat next to the conference coordinator Alejandra Zurita, a good opportunity to exchange ideas on running events. 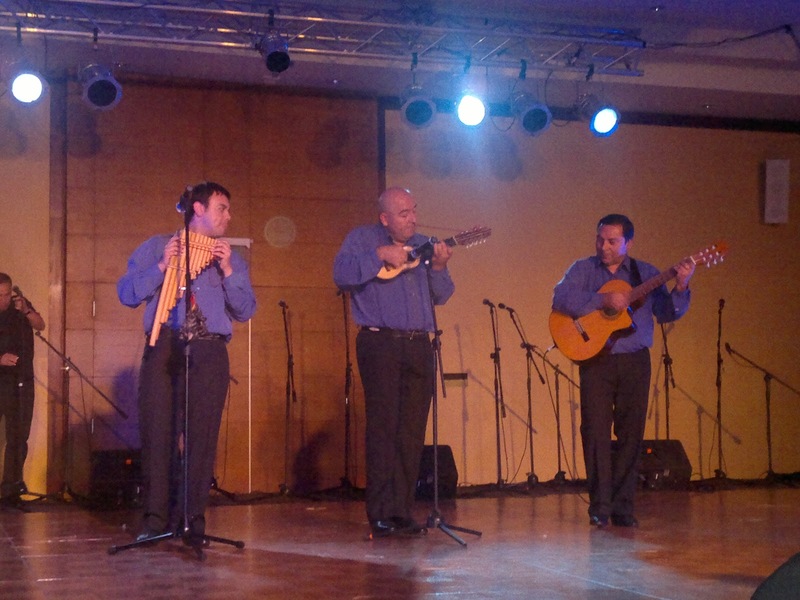 After the meal we were treated to a performance by the Chilean folk group Bafona who performed music and dance from Easter Island, the north of the country and also the central region. This was excellent and seemed to be appreciated by all. Following the meal some delegates decamped to the hotel bar by the swimming pool and then into Santiago to sample the nightlife! Day 2 started off with Juan Yianatos’ plenary session, which rather brilliantly contained a video of the steps he and his colleagues take to carry out their radioactive tracer experiments. Although I am familiar with this work, I hadn’t realised just what was involved in making these measurements, and thought it was an excellent use of the time. The second plenary in the session was also very interesting; John Marsden’s work on energy use and innovation. The comparison of the energy requirements of the different unit operations in copper processing was very interesting (particularly from a teaching perspective!). I then chaired the flotation plant operation session, which proved to be a strong session with several plant case studies and a talk on DAF for coal wastewater (Silvia Franca, CETEM, Brazil). An over-running lunch meant we started the afternoon session late, and was again something of a mixed bag, from the problems of water supply in Chile and Peru (Doris Hiam-Galvez, Hatch) to the role of innovation in the mining industry (Arturo Herrera, Innspiral Moves). 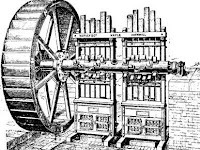 Overall, in the flotation section (sadly I didn’t get to see much from comminution), the papers were strong and covered a wide range of topics. The focus on operations was especially clear in the Friday morning session, and is what makes this conference different from the MEI Flotation series. For me, Procemin is a great conference for disseminating our research to a largely new and enthusiastic audience. After a final address to close the conference, delegates were treated to a raffle with prizes including Chilean wine and copies of mineral processing books. 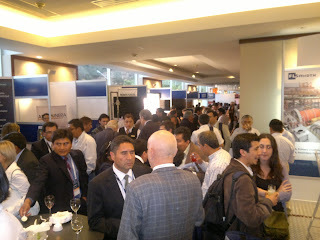 The exhibition area was then the venue for some final pisco sours and networking. Procemin 2011 was a great chance to meet new contacts and was professionally run, the next event takes place in November 2012. 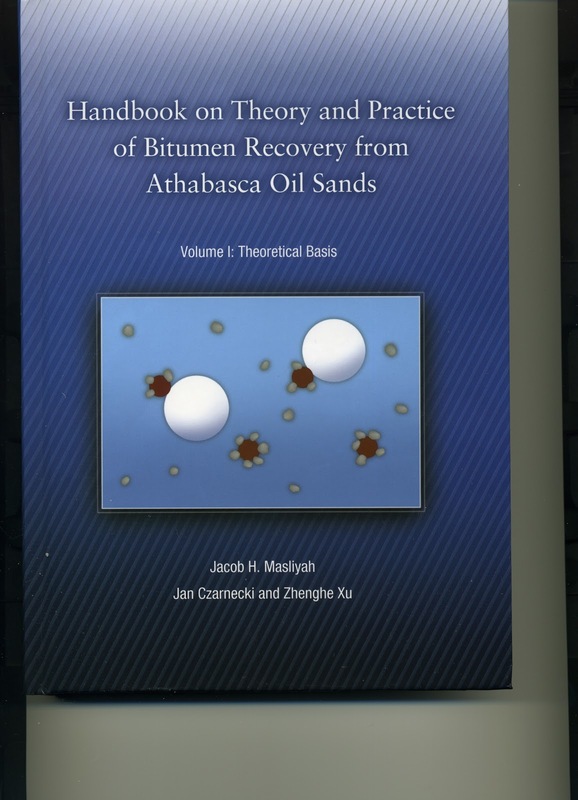 We have just received a copy of Volume 1 (Theoretical Basis) of the Handbook on Theory and Practice of Bitumen Recovery from Athabasca Oil Sands by J.H. Masliyah, J. Czarnecki and Z. Xu. Synthetic crude oil derived from oil sand deposits is of major importance for energy supply in North America for the next century, so bitumen extraction fundamentals has become quite relevant. Volume 1 deals with physical and chemical properties of oil sands, application of surface and colloid science to bitumen recovery and tailings management, emulsions and fluid-particle dynamics. The authors expect to have Volume II, dealing with commercial operations, ready by next year. Comments on the book are welcome. Click here for ordering information. Elsevier's Executive Publishing Manager, Dean Eastbury, and I met in Franschhoek last Friday to discuss the continuing evolution of Minerals Engineering, now established as the world's number 1 mineral processing journal. It has the highest impact factor of such journals, and the special conference issues contribute highly to this, particularly those in the fields of biohydrometallurgy, flotation and environmental issues. The number of papers submitted is increasingly annually, with over 550 in 2011, of which 63% were rejected. The rejection rate has been steadily increasing to maintain page budgets and standards. Accepted papers from Australia and South Africa continue to dominate, while submissions from North America remain disappointing. China accounts for just over a third of all submissions, but unfortunately has a relatively high rejection rate of 82%. Three years ago in Beijing, Kari Heiskanen, editor of International Journal of Mineral Processing, and I presented a workshop on preparing papers for international journals, but it would appear that most of what we suggested fell on deaf ears! ScienceDirect usage grows rapidly year by year and in 2011 the number of downloads is predicted to be over 400,000, compared with 372,500 in 2010, staggering figures, and around double the number from IJMP. It is interesting to note that 11 of the 12 most downloaded papers are reviews. For those not subscribed to ScienceDirect, abstracts can be read free of charge, and full papers purchased in pdf format on a pay-for-view basis. 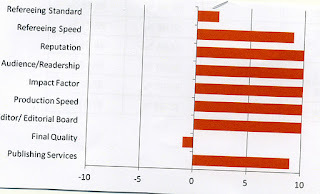 Of particular interest is author feedback (left), where authors are invited to rate a number of statements concerning their publishing experience. Authors are also asked to rate another journal to which they have recently published. 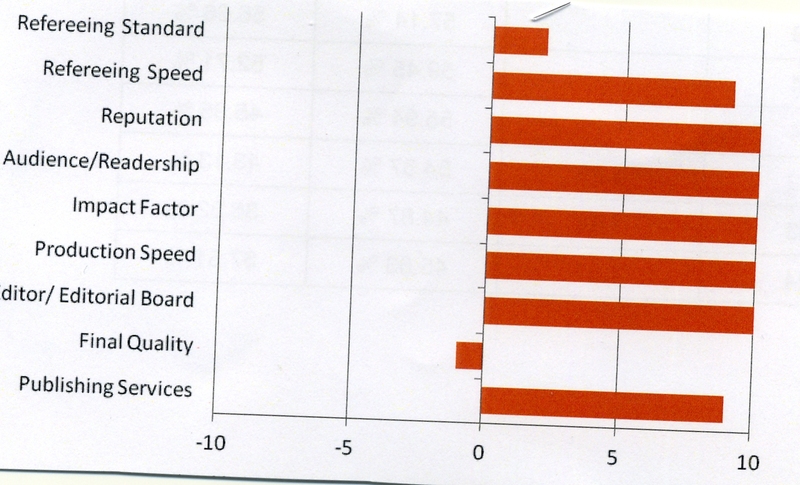 The score for each area for Minerals Engineering is then compared against the average of all other titles. The average score, or benchmark, is zero on the chart. Scores above zero mean that, for that area, Minerals Engineering is rated higher than average and scores above 5 place Minerals Engineering in the top third of all journals. The results speak for themselves. Minerals Engineering has always strived to produce a rapid, high quality refereeing and publication service and has a shorter turn-around time than the average for a typical research journal. For that I thank the professionalism of Dean and his staff at Elsevier, and to all my Editorial Board and reviewers who give up their valuable time to maintain the high standard and reputation of the journal. After just over three weeks in Africa, we are now at Cape Town airport, waiting to board our flight back to the UK. 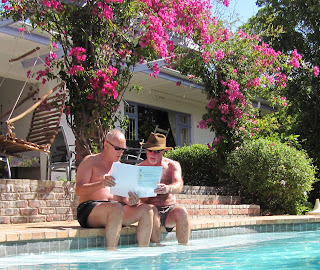 Our final two days were, as always, spent in Franschhoek, only a one hour drive from the centre of Cape Town. 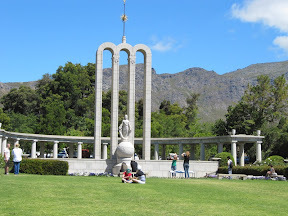 Franschhoek is one of the oldest towns in South Africa, 176 French Huguenot refugees having settled in the valley in 1688, and lending their names to the many superb wine farms in the area. At the end of the main street stands an impressive memorial to their heritage, with an associated museum. This small Huguenot town is notable for having some of the top restaurants in South Africa but it is also ideally situated for driving to Cape Town International Airport against the horrendous flow of traffic out of the city in the early evening - perfect if you have an evening flight out of the country. We have sampled many of the fine restaurants over the years. Many of these are on the wine farms, such as the wonderfully situated La Petite Ferme, but last night we met up with Elsevier's Dean Eastbury, and ate at one of our favourites, Kalfi's, a small family run restaurant on the main street, favoured by the local residents. 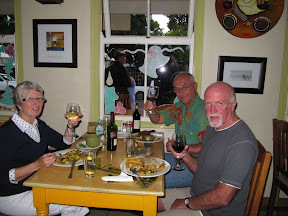 Simple local food, such as chicken pie, bobotie and karoo lamb chops, accompanied by excellent local wines. 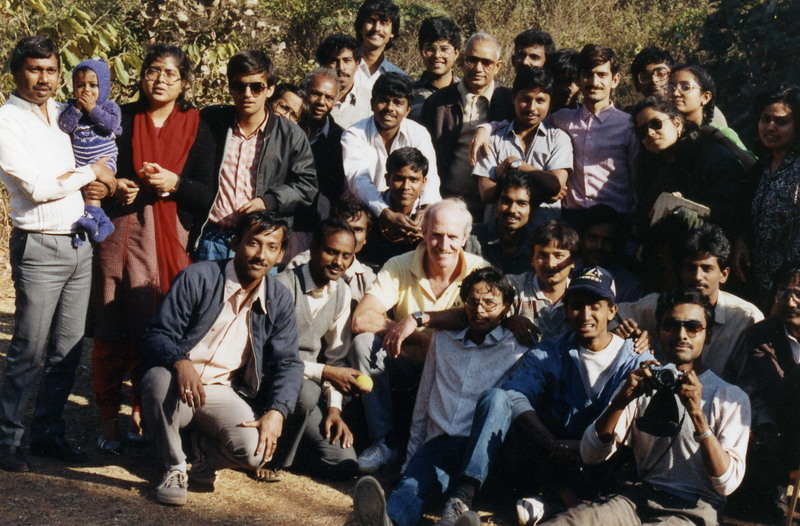 In February 1989 I spent 2 weeks visiting the Indian School of Mines in Dhanbad. In this picture I am with final year mineral processing students and Prof. T.C. Rao. I would love to know if any of the students in this photograph can be identified, as I am sure that I will have met up with a few of them at various conference since.